I am a Work at Home Mom, or WAHM, and that poses some interestng challenges when it comes to balancing work, kids, and the house. One of the areas that I struggle with most, is my own organization. I can organize kitchen cabinets, craft supplies, and toys with the best of them but when it comes to my own time and work, I am TERRIBLE. I constantly start a project, get sidetracked, start another project, get sidetracked again, and eventually go back to the first project I started only to end up on Facebook or Google+. As the New Year starts, I am really working on managing my time and better organizing myself so that I can stay on track, get what I need to done, and still find time for the kids and the house. I have decided to write out a daily routine so that I have something to go by. This is generally what I already do, but I feel like giving myself time blocks in which to work I can really focus on the task at hand. And of course, everything is very flexible. 5-6am Primary Writing Block/Social Media/emails: This is me, in my PJ’s, drinking a cup of coffee and browsing through Social Media and Email. I also write, edit, and publish blog posts at this time. The goal is to ONLY do this until 6am, in the past I may have been in the middle of a post and thought I could finish, only to find it was 7am and I was way behind schedule. 6-7am Prepare for the Day: aka Shower and Get Dressed. 7-8am Morning household routine: breakfast/lunches/kids ready/1 load laundry/10 min clean-up. The kids get up at 7am on school days and more or less get themselves ready. After I do breakfast, I will do a quick 10 minute clean-up, pop in a load of laundry, and pack lunches. 8-830am School Drop off: We are out of the door between 8-8:05 and walk to school each morning. I love that we can walk to school, it is a great opportunity to get out and get some fresh air. 830-1130am Morning Production Block: meetings/supplies/process orders. This is the time to schedule meetings, calls, run out for supplies, and work on orders. 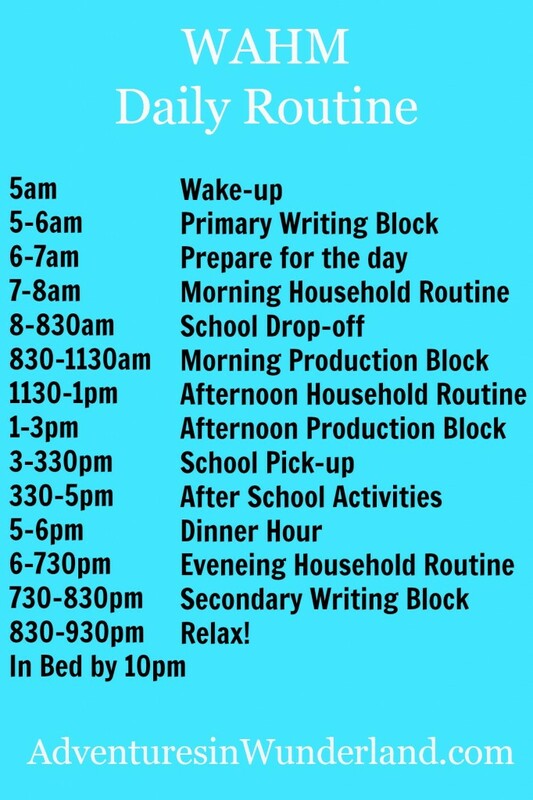 This is my most flexible time block which often ends up being my youngest and I running errands or meeting up for a playdate with friends. 1130-1pm: Afternoon household routine: Kinder pickup/lunch/15min cleanup. This is the time we would be having lunch, picking up from Kindergarten (M & F only) and another 15 min. clean-up. 1-3pm Afternoon Production Block: meetings/supplies/process orders. Very similar to the morning production block. I use this time to process orders, ship orders, etc. This is also a time for me to work on DIY projects, Crafts with the kids, and recipes. And of course the best part of my job means that some days I schedule ‘meetings’ at the park with my littles. 3-330pm School pickup: Again, we walk over to the school and back. 330-5pm: Afterschool activities/social media check: Yes, you read that right. My children play sports, take dance lessons, and attend church classes after school during the week. I use the time that they are participating to update social media. I am “that” mom, on her phone. 5-6pm: Dinner Hour: Family dinner is very important to us and we try to sit down together most nights. 6-730pm Evening Household routine: Baths/Dishes/quick cleanup/bedtime. After dinner the kids go directly into the bath and the little one to bed at 7pm. The older two follow at 730pm. A quick cleanup is doable with everyone pitching in. Yes, you read that right also, my kids go got bed at 7 & 730. They get there 12 hours of sleep and are well rested by 7am the next morning. 730-830pm Secondary Writing Block/social media/email: This is the time for me to catch up on emails, finish writing what I may have started in the morning, and of course that pesky social media. 830-930pm relax! I have a really hard time shutting off and relaxing but I am going to make it a point to really work on that and shut everything down at 830. In bed by 10pm. Sometimes I’m there earlier, sometimes later but I do always try to get 7 or 8 hours of sleep. Mama cannot function without sleep! You lost me at getting up at 5am. Yawn, stretch, roll over, go back to sleep I say :). I totally get what you mean though, I have no set schedule other than wake the kids at 6:30 and check social media and emails with my first cup of coffee until 7. After that I'm like you, I get distracted and start but don't finish projects. I need to be better organized this year too. haha, ya most people think I'm nuts for getting up that early but It's the only way I can get myself ready before waking the minions. And my husband is usually getting up at that time (or earlier!) too, so it works. But for many, you could just simple shift the time blocks to fit with your schedule. A big thing for me is limiting my email/social media checking to the specific time blocks. whoa! 5am?! I got up at 615 this morning and was super proud of myself - LOL! This is a good reminder, I have been trying to turn off the computer earlier at night - I need to make a schedule like this for sure! haha! Yes....5am! I am a morning person so it makes it easier, but ya, it's super early. I think a schedule will definitely keep me on track AND give me more time for the house and the kids. You are so dedicated getting up that early.... my hubby tells me I would be way more productive if I got up before the sun.... I just feel like sleep is so nice! ya know after having 3 kids who took forever to finally get all 3 sleeping through the night. I never valued sleep as much as I do now that I actually do sleep through the night again. The rest of it - totally cheering for you on blocking time for specific tasks/projects. let us know how it goes come Feb! I love this, thank you for sharing your day! My kids are 5 months and 4.5 years, so it wouldn't work for me right now. I've never thought about assigning blocks of time to try to get things done. I'm home full time with the kids and trying to launch a few fun projects! Hi Melissa! Thanks for reaching out, I have a few suggestions to share....first, I try to keep the meals during the week super simple so they only take 20-30 min. to prepare. I also use my crock pot if I know my day is going to be extra busy. I typically prepare dinner around 2pm before I head to pick up my older kids from school and then finish pop it in the oven or finish up any sides when we get back home. This can also work if you prep your dinner int he morning and then do your cooking just before you serve it. I've found that by prepping earlier, it makes the clean up easier.